I hope you have a great season and stuff the freezer! Thanks , I like Steaks . I love Steak and Taters . I grabbed my 44wcf and went out shooting . I had forgotten how good that pistol shot . I recently purchased a Star bm and have been playing with it . It's a Great shooter also . Single actions and 1911 are my favorites . Those Star BMs are fun ain't they? Haven't purchased one but have shot it recently. And I need to get my Cimarron out. I haven't shot black powder .45Colts in a year!!! Your right the Star BM's are fun to shoot . They are small easy to conceal but big enough your hand fits it . And no I haven't shot no BP in a while . I have loaded unique and it shoots about the same poa as the BP . These aren't no wimpy loads , but they aint no magnum load either . Just trying to copy the original 44wcf loads . I am getting geared up for Deer season . Went out shooting and the old 44wcf still shoots a good group . l would love to take a nice fat Doe with the pistol . Time will tell . I'm late to the party but a big fan of the 44 Special and the 44wcf. All it takes is a spare cylinder to do both. Have to say thought I am partial to the 44wcf over the 44 if you want a lighter bullet (some advantages to that at times.) Liked the first one (7.5") so much so much had to have on in each barrel length. Some of the best guns I own. All of them shoot exceptionally well. The 5.5" gun has to be one of the most accuate SAA guns I have ever shot. That includes a lot of high dollar guns...that don't shoot nearly as well as all three of the Cimarron's did out of the box. Here is an early group out of the short 44wcf. And a little later after I made a new set of grips. Those grips look real nice Yahoody. Are they real ivory? Those grips look real nice. Are they real ivory? Thanks. Nope not ivory. But I'd bet money dang few could ever tell they aren't. I can't and I have several pairs of real ivory. I made these up a month or so ago and have been real happy with them Including today when I chucked this gun into the gravel road I was shooting on. No harm to the grips or the glue seams which kinda shocked me. Not so good on the gun's finish however.. Frankly I expected the grips to be more fragile. I'd likely never shoot an animal at this range..65 yards with a 200gr, 44-40 but nice to know you could. 18" gong. I really like this gun. I like the price even more so when they shoot like this! That resin-ivory is real nice stuff. Nice shooting too. At some point I think I am going to have to get a Uberti Bisley in .44-40 or .38-40 and/or a Uberti Model P in .32-20 and give them bone charcoal and resin-ivory treatment. The Bisley and the .32-20 are in my mind good choices for this because they are either hard to find or insanely expensive, or both, as USFA's or Colt's. Deer season is almost here . I will be hunting with my 44wcf's . I use a Uberti rifle and carry my Cimarron Pietta . Here is a Buck I killed a few years back . Funny now when I think back on it. I was just a kid in '57 when the Model 29 and Blackhawk were first available as 44 mags. I saw the Ruger early on but it was a long time before I ever saw a 29 even though the hand gun I most often got to shoot was a S&W. Now having the luxury of owning any hand gun available, I don't even own a 44 magnum these days. But I do shoot a lot of 44 Special and 44-40. Both cartridges in handguns primarily, but in lever guns as well. The 44 magnum versions of either are long gone. Never to be replaced. 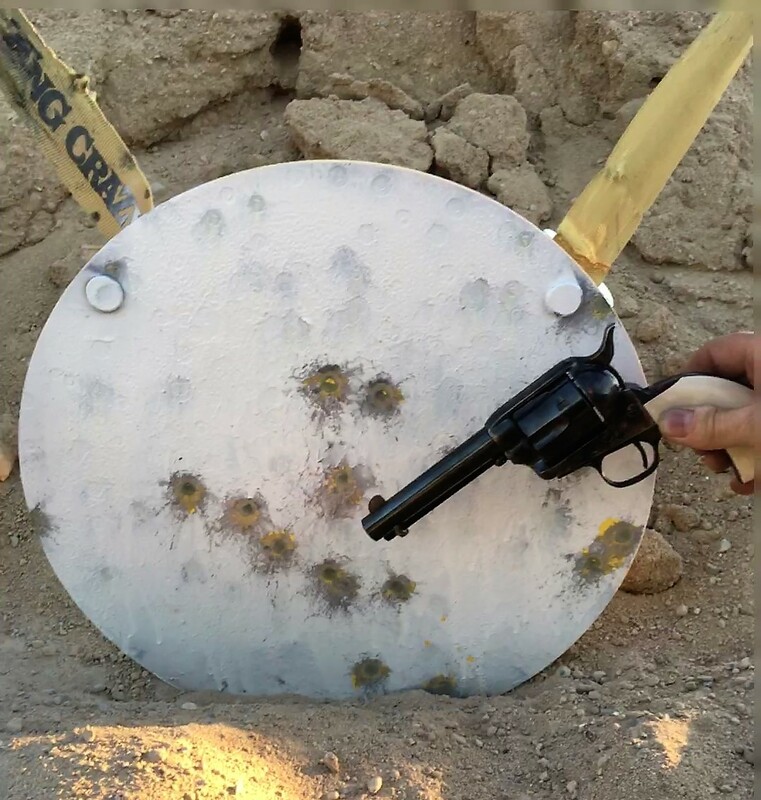 I killed enough, punched enough paper and rang enough to know what a 44 mag 240gr or 300gr slug will do. But I sure don't turn up my nose at the 200gr lead bullets in a 44-40 these days or a 240gr SWC out of a short 44 Special either. I'd rather use a SAA of shoot/hunt/carry of any make than a more modern S&W 29 or any Ruger that has been built since. I've carried all of three in the field enough to know the difference and their limitations. I don't need the heavier bullets or guns Elmer Keith envisioned. I find it funny now looking back thinking all those "old men" so impressed with the 44 Magnum back in the late '50s. I'm older now than they were back in the day. They had a better set up in my mind then that could be had cheap....than most of us only dream about owning now. 1st Gen Colt's made after 1910, any barrel length and in 44-40 or 45 Colt. And ammo still available for them if you just asked. ( I know that having to ask for or order in special 38-40 ammo back then) If a 215gr bullet doing 1200fps from a 44-40 didn't do it for you, all it took was a case full of the holy black under a 255 grs of lead to get a 45 Colt up to 1000fps. Not much that can be done with a hand gun that 255grs of lead doing 1000fps won't do. And not a lot of folks that want to shoot a steady diet of that load in a lwt weigh SAA. Over 145 year old designs still as effective as ever. Nice to still see then get used. 44-40 carbine and a 45 Colt SAA. Still just as accurate, reliable and deadly as ever. 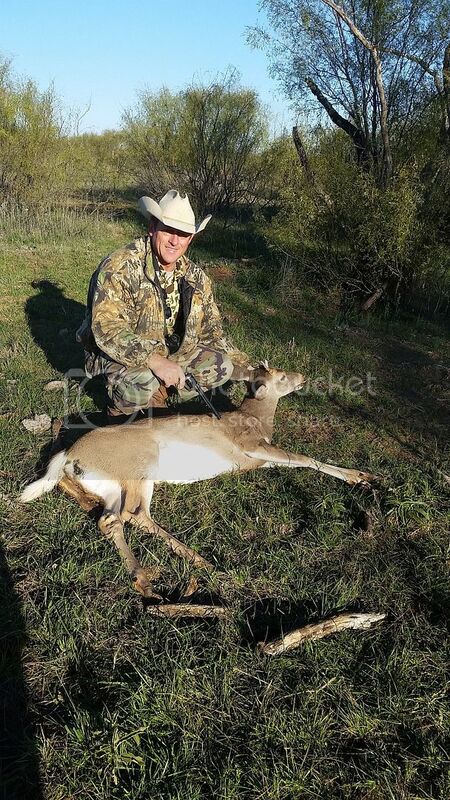 Well Deer season is over and I killed a nice Buck with my Winnie 73 rifle in 44wcf . But no Doe with my Pistol , maybe next year ? Nice, Rowdy. I have never hunted but I'd like to. Just wondering if anyone carries a SSA while hunting ? And in what caliber do you prefer ? And what is your favorite caliber to shoot ? I don't hunt but I do a lot of plinking in the woods with my rebored Marlin in 38-55 and I carry a 44 Special Uberti or Colt as a sidearm. The 38-55 is reloaded to about 1600fps and is a pleasure to shoot (it would make a good hunting load). I have a Uberti carbine in 44 Special which I have not yet shot. Nice work on taking your buck with the '73, Rowdy. The 38-55 is a real sweet heart to shoot . I had a Marlin Cowboy in 38-55 and after THEY opened the chamber up to accommodate a larger lead bullet it shoot Great . Hey Cowboy Guns will still take game today It's just everyone thinks they need a 300 magnum to kill a Deer . Well....I guess I'm backwards. SOMETIMES I carry a rifle while I'm hunting with a single action, but not always. Congrats on your Deer .